Which is the US hardback first edition/first printing of Gone, Baby, Gone, published by William Morrow in 1998. 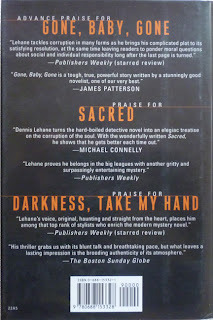 This is Lehane's fourth novel, and once again stars Boston P.I.s Patrick Kenzie and Angie Gennaro. And of all the Kenzie-Gennaro books, this one's probably the best known, at least in the UK, due to the fact it was turned into a movie in 2007, directed by Ben Affleck. It's a decent film, although, as I mentioned in that post on A Drink Before the War, a little lacking in the sarcastic wit that permeates the books. Of course, it's not unusual for a book to be better known through its movie adaptation than through people actually reading it, but in the UK, Dennis Lehane's work has been more susceptible to that fate than most. Thus far there've been three films made of his books: Mystic River (2003), Gone, Baby, Gone and Shutter Island (2010), all good movies in their own ways, directed by two masters of their craft – Clint Eastwood and Martin Scorcese – and one increasingly interesting up-and-comer. And I'd bet that if you mentioned those titles to most Brits, they'd immediately think of the movies and not the books. Indeed, they might not even be aware of Dennis Lehane at all. 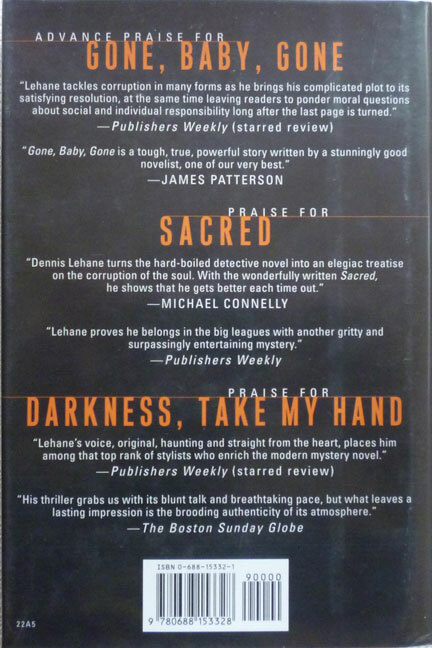 Even in the wake of three pretty successful film adaptations, Lehane still hasn't quite broken through to that indefinable but very real 'greater consciousness' that marks out the big bestsellers. One indication of that is that Gone, Baby, Gone never saw hardback publication in the UK. Severn House brought the first three novels into hardback in 2000, but not the fourth; Gone, Baby, Gone went straight into a Bantam paperback edition in 1999, as did its successor, 1999's Prayers for Rain. That in itself isn't unusual – plenty of novels go straight into trade paperback editions these days, missing out hardback publication altogether – but combined with the fact that the three Lehane novels before those two – A Drink Before the War, Darkness, Take My Hand and Sacred – also went straight into paperback in the UK (before belatedly being published as hardbacks by Severn House) speaks to a prevalent view in Britain of Lehane's work – however unfair – as lower rung genre fiction. 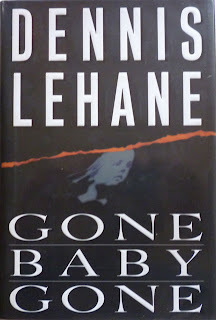 Mind you, Lehane's non-Kenzie-Gennaro novels were first published in hardback in the UK, by Bantam again (Mystic River, 2001, and Shutter Island, 2003) and Doubleday (The Given Day, 2009). But I don't know if any of those set the sales charts alight, except perhaps with surges for the later paperback editions in the wake of the movies for those first two. All of which does present something of a challenge for Lehane's latest UK publisher, Little, Brown, who have picked up the rights for his new book, Moonlight Mile, which they'll be publishing – in hardback – in February next year (it's already out in the States). And not only have they got the author's relatively low recognition factor to deal with, but Moonlight Mile is also pretty much a sequel to Gone, Baby, Gone. In Gone, Baby, Gone, Kenzie and Gennaro are hired to find four-year-old Amanda McCready, who's abducted from her home; what follows is a murky, labyrinthine tale of lies, deceit and dark secrets. Without giving too much away, Amanda, now 16, also features in Moonlight Mile, where she goes missing again. So not only is Moonlight Mile the sixth book in a long-running series, it's also a sequel to the fourth book in the series, which was published over ten years ago. That's quite a lot for Little, Brown's publicity department to deal with. It'll be interesting to see how they handle it (and I hope they succeed). 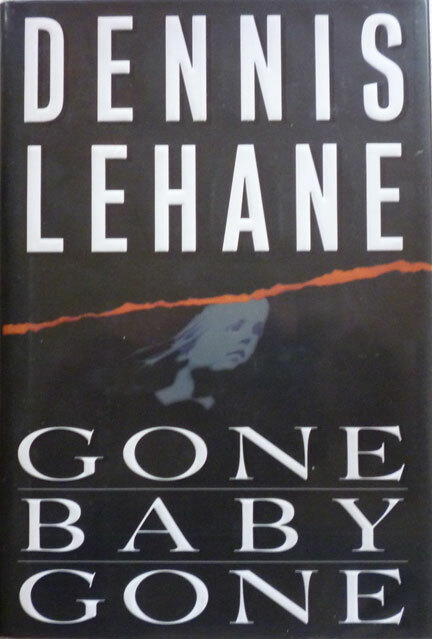 This first edition of Gone, Baby, Gone – which I got from the same seller as the previous three Lehane firsts – was designed by Cathryn S. Aison, while the dustjacket was designed, once again, by Bradford Foltz (see also Sacred and Darkness, Take My Hand). And that's about all I have for this post. How did we do on the 'interesting' front? No? Ah well, never mind. There's only one more Lehane post to come, and then it's back to Westlake and co.